This antibody may replace item sc-18690 from Santa Cruz Biotechnology. KLF2 belongs to the krueppel C2H2-type zinc-finger protein family. It contains 3 C2H2-type zinc fingers. KLF2 binds to the CACCC box in the beta-globin gene promoter and activates transcription. 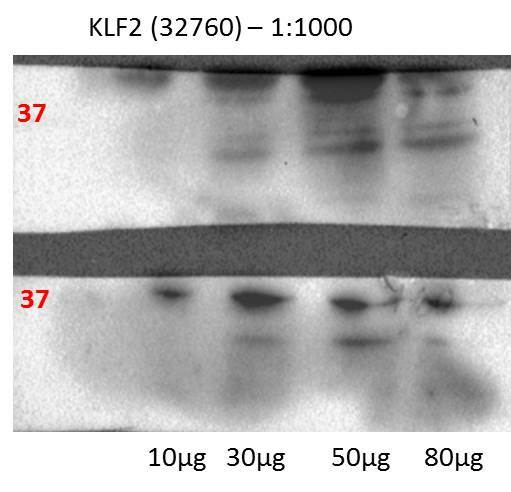 Find tissues and cell lines supported by DNA array analysis to express KLF2. Find tissues and cell lines supported by RNA-seq analysis to express KLF2. "Very satisfying – will be purchasing in a future"
6. Add 1-2 drops of the VectaStain ABC Reagent and incubate at RT for 30 mins. 7. Rinse slides in PBS twice for 2 minutes. Remove them after 2 minutes and put them back on the tray. Did you use an antigen retrieval method?